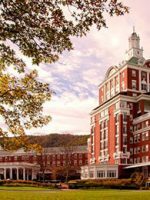 The Greenbrier Resort, White Sulphur Springs, W.V., is a rare breed: a recently revitalized National Historic Landmark that sprawls on 6,500 acres in the Allegheny Mountains. 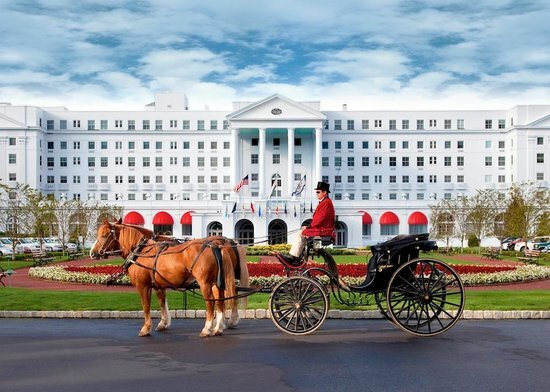 After a just completed mega-million dollar renewal, the 721-room Greenbrier never looked better. Among the Grande Dame’s newest charms are an $80 million, 102,000-square-foot gaming casino slated to open in July, and the first Greenbrier Classic, a PGA golf tournament July 26 to August 1, 2010. 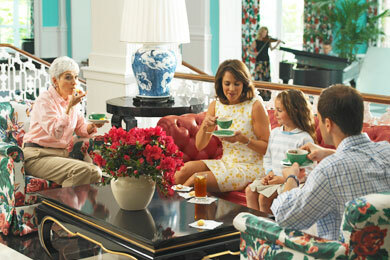 Along with such grown-up goings-on, the Greenbrier offers much for families. What we especially like is that we find all the traditional activities we expect at an AAA Five Diamond property — swimming, tennis, golf — plus some that we don’t, such as falconry and off-road driving. For the past few years, the Greenbrier was in financial difficulty. 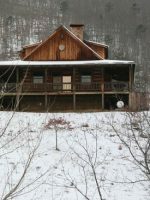 In May 2009 Jim Justice and his Justice Family Group purchased the property and began a multi-millon dollar revitalization. They added new restaurants and refreshed rooms while maintaining the spirit of legendary interior designer Dorothy Draper’s decor. Yes, the resort is still a swirl of pink and green, but the hotel exudes a new sparkle plus such modern touches as WiFi, a trendy steakhouse and new restaurants to debut in the casino area. People have been coming to the Greenbrier since 1778. Called the White Sulphur Springs hotel for its first 125 years, the property’s healing waters lured the rich and famous. Closed during the Civil War, the resort gained a wider audience with arrival of the Chesapeake and Ohio Railway. The company purchased the resort in 1910, added the Greenbrier Hotel to the existing cottages and an 18-hole golf course. Among the luminaries who vacationed at the property in 1914, the first time the resort remained open year-round, were President and Mrs. Woodrow Wilson and Joseph and Rose Kennedy, who honeymooned at the Greenbrier in October. For more than 30 years, the Greenbrier kept a Cold War secret. Between about 1959 to 1962, the federal government built a vast underground Emergency Relocation Center, or bunker. In case of nuclear attack or other deadly security threat, the entire U.S. Congress was to be relocated to the bunker. After the Washington Post exposed the bunker in 1992, the government phased-out the facility. You can tour the underground facility, part of which is used for data storage for Fortune 500 companies. With its casino and updated restaurants, the Greenbrier’s betting on a new customer. For long-time fans, the Grande Dame still exudes southern charm. After a four-and-a half hour drive from Washington, D.C., we arrive in the afternoon, greeted by trays of sweets, glasses of wine and water. After all, the lady knows how to entertain. The legendary interior designer Dorothy Draper decorated the Greenbrier in 1946. True to her original style, rooms feature her signature cabbage rose chintz paired with bold stripes. In our room, lively pink and green drapes match the chairs and the dark wood furniture recalls the 50s. 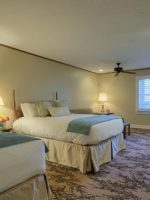 Not trendy, the rooms seem more like period pieces, but they are over-sized, comfortable and come with Internet access, flat-screen televisions and stocked refrigerators. In-room coffee makers and bathrobes may be requested. A sweet touch: "Shhh- It's sleepy time down South" is printed on the nightlights. Rooms in the original hotel built in 1913 tend to be larger than those in the wing built in the late 50. Many families book the one- to three-bedroom guesthouses, which come with a sitting room with fireplace and pull-out sofa and a front porch. The Greenbrier is iconic and lives up to its reputation. It is set in the beautiful mountains of West Virginia. The property is gorgeous and full of charm. There are lots of ammenities-activities, shopping, restaurants, and a casino. The Greenbrier should be on everyone's "bucket list"! My friends and I had a wonderful visit to the Greenbrier. We enjoyed tea time, the Easter chocolate exhibit, our lunch at Drapers, and our shuttle driver Scott. Scott was very knowledgeable and friendly. He shared some of the resorts history. He answered our questions with a smile. 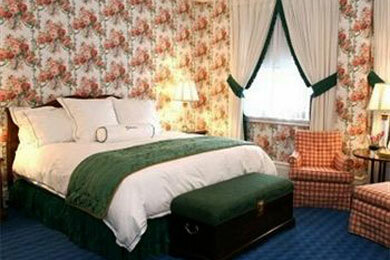 If you are planning a girls weekend, be sure to visit the Greenbrier. 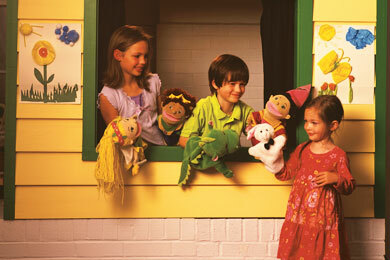 The Adventure Zone keeps ages to 12 busy with supervised activities from 9 a.m. to 4 p.m. daily. Choose from full- or half-day sessions with lunch. You must reserve the program at least 24 hours in advance. Typically kids divide into groups for ages 3 to 5 and 6 to 12. The brightly colored space features a stage, puppet playhouse, craft area and a separate butterfly adorned playroom for ages 3 to 5. Kids also explore the property. They swim in the indoor pool, visit the falcons and the horses, go for carriage rides, bowl, fish for trout in the stocked stream and play basketball and horseshoes. In June, July and August kids may also enjoy dinner plus bowling and movies on Friday and Saturday nights from 6 to 10 p.m. From September through May, the program operates on Saturday nights only. Reserve ahead. With three courses, including the Old White, host to this summer's Greenbrier Classic, the resort's first PGA tournament, the Greenbrier is a good place for golf lovers. The Family Golf program makes it more affordable to teach your kids the game. Instead of the typical fee of $195 per adult, the entire family gets to play nine holes with a cart, clubs, shoes and balls for $195 after 4 p.m. The resort has five indoor and five outdoor tennis courts, plus tennis and golf clinics for juniors in summer. Along with an indoor swimming pool, nice in fall and winter, the resort has an outdoor pool with a splendid view of the distant mountaintops. You can also go hiking, mountain biking and horseback riding. For old-fashioned fun, try horseshoes and croquet, go bowling and watch complimentary movies on selected evenings. Little ones especially like touring the property via horse-drawn carriage. In winter, the horses pull sleighs. Playing "chicken" with a hawk is just one of the surprises we encounter. When Jack, a Harris' Hawk with a fierce-looking hooked beak, swoops an inch above our heads, we flinch. Jack's not interested in us; he wants the chicken neck proffered by the Greenbrier's falconer. The birds are fascinating. Not fond of monster machines or mud holes, we had low expectations for two hours of backwoods driving. Coached by our guide, we ride our jeep over ruts, drive sideways up a slope to curve around a tree, plunge through two foot-deep ditches and crawl up -- then down -- steep hills. Teens love this. They need to have at least a learner's permit to get behind the wheel. 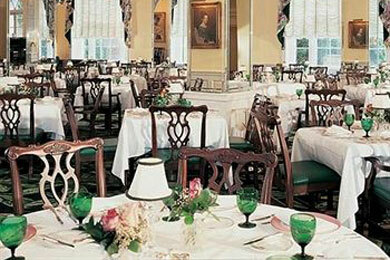 Except for dining at Draper's Cafe, meals at the Greenbrier can be pricey and take time. For quick snacks and sandwiches for outings as well as for coffee, we head to the Greenbrier Gourmet Coffee Bar, located in the resort's retail row. Although the take-out eatery also serves breakfast bacon and egg sandwiches, the place doesn't offer any kid-friendly cold cereal. That's not too much of a problem for the kids who are likely to want one of the chocolate donuts staring at them from the pastry case. 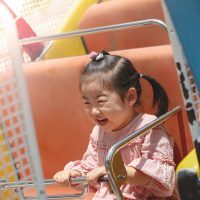 Although all dining rooms have high chairs and booster seats, the formal main dining room, which does have a children's menu, may be too slow for little kids. Older ones who can sit quietly through a two-hour meal, especially those who like getting dressed up and equate dining to piano music as something for princesses, may enjoy the experience. The resort suggests that children be at least 12. Sam Snead's, located at the golf course with great views and open for dinner, is much more casual than the formal main dining room and a little less pricey. The American fare ranges from risotto ($29) to rib eye steak. ($49). The wood-fired pizza of the day appetizer ($14) is more designer than kid-friendly. However, the children's menu offers an $8 pizza along with burgers, chicken fingers and for older kids who like steak, there's a 4 ounce filet for $16. Prime 44 West, the resort's new steakhouse, adds a trendy, updated option for dinner. Paying homage to Jerry West, a National Basketball Association legend and a native West Virginia, the restaurant showcases his #44 jerseys, champion rings and trophies. The Wagyu tenderloin at $12 an ounce is pricey but worth it. However, forego the seafood appetizer plate for two. It's mostly tasteless. Meals come with complimentary warm, cornbread, baked according to the award-winning recipe of the owner's wife, Cathy Justice. You get to keep a copy of the recipe printed on a blue ribbon. Entrees on the children's menu range from chicken fingers ($15) to filet mignon ($18). Serving salads, fried chicken and other "southern comfort foods," Draper's, in July, moves to a section of the new casino complex that's open to all ages. The complex will also have In-Fusion, a Pacific Rim, sushi restaurant and Cafe Carleton for coffee and pastries. The Forum, an Italian restaurant, is scheduled to open in mid-July in the north lobby where Draper's is currently located. So far, the small town of White Sulfur Springs has few restaurants, but if the new casino, which will be open to non-resort guests, becomes popular, eateries are likely to open. Babysitting services are available with advance notice. Cots, cribs and child-proofing kits are available at no cost, but request ahead of time. For a nice afternoon interlude, show-up for the daily (4:15 to 5 p.m.) complimentary afternoon tea served with sweets and accompanied by a pianist. A trio plays in the ornate main lobby on Friday and Saturday evenings. Dancing with your kids and partner to the classic rock tunes and requests is fun and a nice way to meet other guests. Along with a gym, the resort features an upscale and soothing 40,000-square foot spa. Treatments are available to ages 16 and older. Greenbrier's chocolates are legendary. Watch them being made as well as buy these sweets from the shop in the north lobby. While most resorts offer a store or two, the Greenbrier's retail row includes an art gallery, children's clothing store, upscale women's and men's clothing stores and a Ralph Lauren shop. High season runs from April through October. March and November are shoulder seasons. At Christmas, rates go up again and then low season runs from January and February. Starting June 10, Delta Air Lines will offer daily, nonstop service to Greenbrier Valley Airport from Atlanta and New York's LaGuardia. United offers flights from Cleveland. Non-stop flights are planned from Washington, D.C. 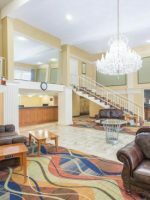 If you are driving, I-64 comes within one mile of the resort, which is located 250 miles southwest of Washington, D.C. and 80 miles northeast of Roanoke. It's about a 5.5-hour train ride on Amtrak from Washington, D.C. Try your luck at the casino then celebrate or console yourselves with a treatment at the Greenbrier's noted spa.